Where Can I Find the Snapchat Stock Symbol? Subject: Where Can I Find the Snapchat Stock Symbol? Investors can find the Snapchat stock symbol on the New York Stock Exchange (NYSE) trading under the symbol SNAP. On the Snapchat IPO date, which could happen as early as March, the official listing will be Snap Inc. (NYSE: SNAP). Snapchat is expected to be valued between $16 billion and $25 billion, and it's easily the most hyped IPO on Wall Street so far this year. In its IPO filing, Snapchat reported it generated $58 million in revenue for 2015. By 2016, revenue jumped 597% year over year to $404.5 million. 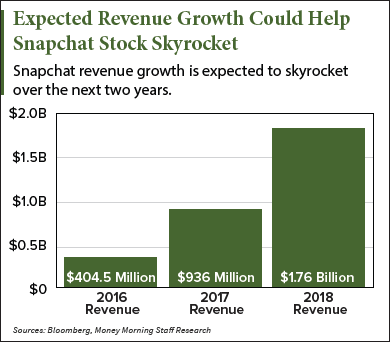 In 2017, Snapchat could generate between $936 million and $1 billion in revenue. By 2018, revenue could climb between $1.76 billion and $2 billion. In 2015, Snapchat lost $327.8 million. In 2016, it lost $514.6 million. In just one year, that's an increase of 56% in net losses. 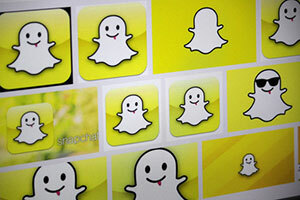 In fact, Snapchat said in its IPO filing that it may never be profitable. That's why investors have been asking us whether Snapchat stock is a good investment.